Round 4 of the 2016 Spring Junior Karting Championship took place on Sunday 20th March. We had 20 Drivers competing and once again it was dry! Jacques Flanders put in a great performance winning all 4 of his heats, which will help him in his title defense! Matthew Baker joined him on the front row. Harry Sadler continued his great run of form making his 4th final of the year lining up 3rd. Alex Mamuda had a very strong run to qualify 4th, with championship leader Josiah Lockett 5th and Alex Acton completed the grid starting 6th. Matthew Baker got a slightly better start than Jacques Flanders and they headed into the first corner side by side, with Matthew’s nose just ahead. They rounded the corner with Matthew carrying a little more speed and was just able to slot his way into the lead. Jacques Flanders was immediately under pressure from Harry Sadler and had to go defensive which allowed Matthew to open up a gap. Alex Mamuda held 4th place and was fighting valiantly to keep Josiah Lockett behind, with Alex Acton ready to pounce. Mamuda’s defending allowed the leading trio to open up a big gap and Josiah saw there was no chance of a podium, so decided to back off and find some clear air to try and set the fastest lap. Out in front though, Matthew Baker had that clear space and he used it brilliantly to set a new fastest lap. Harry Sadler was able to fight his way past Jacques and took 2nd place, while the battle for 4th raged on with Alex Mamuda keeping Alex Acton at bay. Matthew Baker came across the line for the final time to take victory and set the fastest lap on the very last lap of the race. 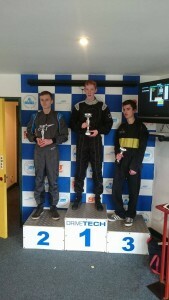 Harry Sadler took 2nd, with Jacques Flanders 3rd. Alex Mamuda was able to keep 4th place with Alex Acton right behind in 5th. Josiah Lockett was able to close up massively pushing them over the line, setting his best lap on the very last lap, but it wasn’t enough to take the Fastest Lap point, as he fell short of Matthew’s fastest lap by 0.09 seconds. The driver of the day award went to Jamie Blanchard, who drove well all day and fought very hard to take a handful of 2nd places against some fierce competition. Unfortunately he went home before the presentation and was not around to pick up his driver of the day medal. Josiah Lockett still has a big lead in the championship over Harry Sadler, but when drops come into play the top 4 will close up with both Jacques Flanders and Matthew Baker having missed the first round. Round 5 of the championship takes place on Sunday 3rd April at 1:30pm. We hope to see you then!